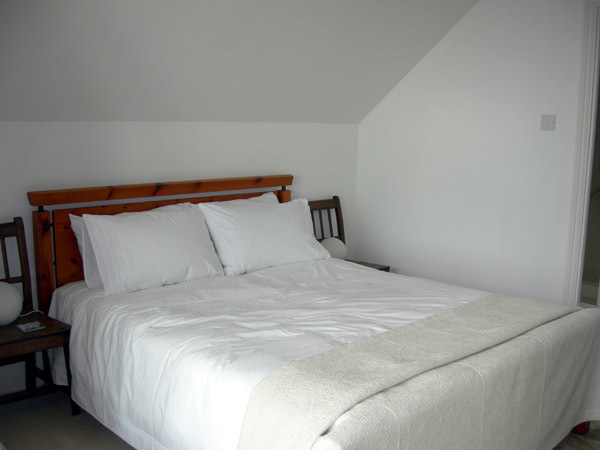 Gills Cliff House provides spacious high quality accommodation for seven people in four bedrooms. The rooms are generously sized and most have sea views. 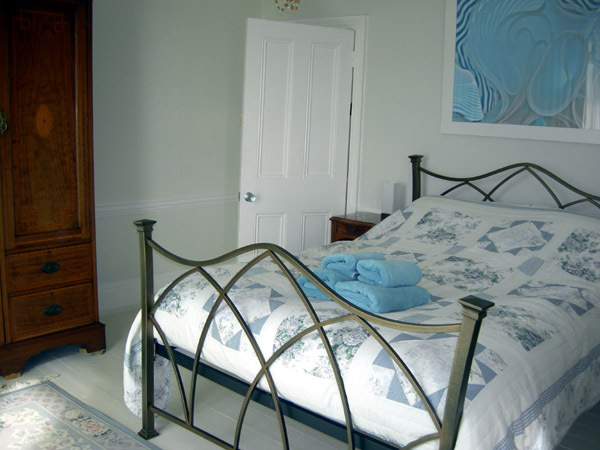 Rooms are decorated and furnished to a high standard. The main rooms have painted wood flooring. Wireless high speed Internet is available throughout the house (WPA encrypted – password supplied), although no PC is provided. The house is fully centrally heated by a gas boiler. We regret that pets cannot be accommodated. Gills Cliff House is a no smoking house. A high chair and travel cot are available for young children. Entrance Hall: The large entrance hall has a handy chest of drawers and all of the downstairs rooms go off it. There is a small storeroom which has iron and ironing board in it. 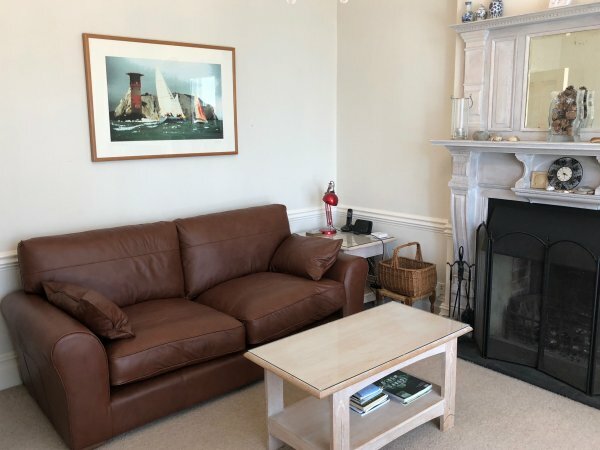 Living room: a lovely room dominated by an imposing working fireplace (logs provided in appropriate seasons) and chandelier with double french window opening out to the decked area. It is furnished with two 3-seater sofas and one 2-seater sofa and small tables. The television is a large Toshiba HD flat-screen with a Freesat HD box and blu-ray player. Dining Room: another lovely room with a chandelier. There is a large dining table seating 8, a dresser and a sideboard. There a docking station for an iPod and a selection of games. This room also has a double french windows opening out on the decking. 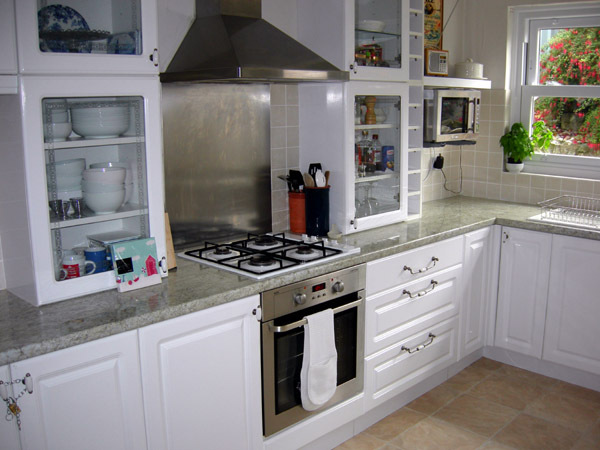 Kitchen: The kitchen has modern units with crockery, cutlery and cooking pots/pans/utensils for 10 people. The hob is electric, as is the oven which has a grill in it. The fridge/freezer and dishwasher are built in. 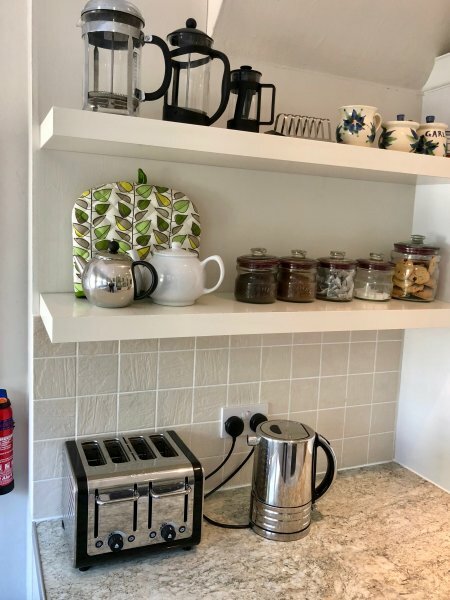 There’s also a microwave, toaster and electric kettle. Downstairs toilet: A handy room with a toilet and wash basin as well as the washing machine. 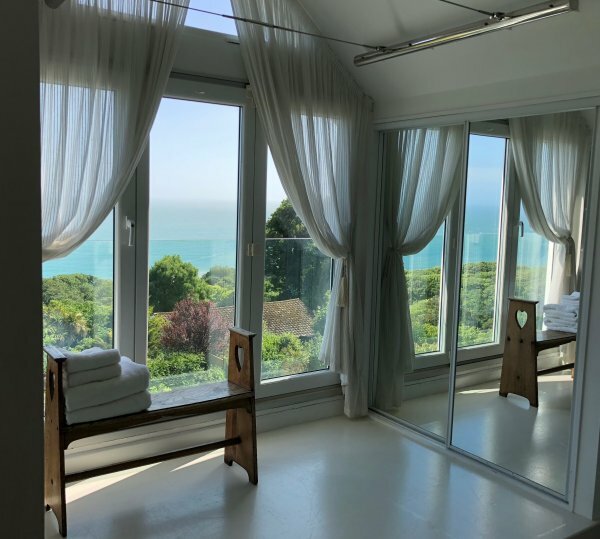 Bedroom 2: a lovely room with windows in two walls – one of which is a large floor to ceiling window looking over Ventnor park to the sea. 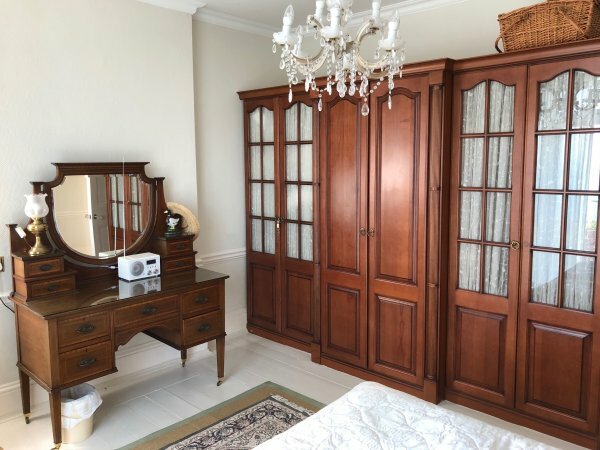 There’s a king size bed, large wardrobe, drawers, a dresser, chairs, chandelier and a full length mirror. Bedroom 3: Like bedroom 2 this has a large floor to ceiling window with sea view and a window in the side wall. As well as a double bed there’s a large wardrobe, dressing table, easy chairs, chandelier and a telescope for watching passing ships. Bedroom 4: This is a smaller room with a side view window. It has a 4 foot bed, so generous for one person. Bathroom: This is a well laid out room which has a toilet, wash basin, centre fill bath, heated towel rail, cabinet and a power shower in a separate enclosure. Bedroom 1: The whole of this floor is a master bedroom suite built in the eaves. 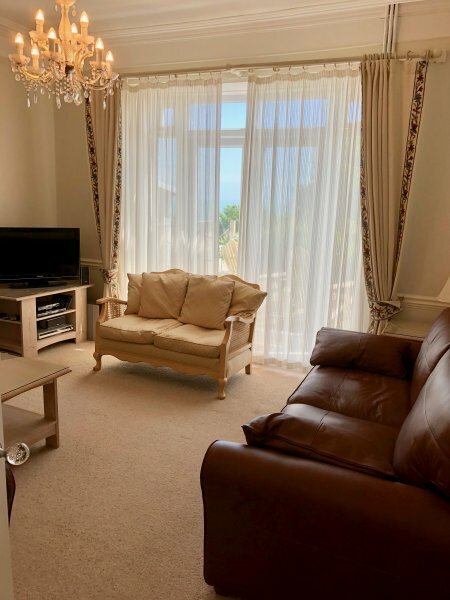 The floor to ceiling window gives panoramic views across Ventnor Park to the English Channel, and there’s a bench and telescope in the window to take full advantage. The bed is a double and there’s mirrored-door wardrobes/shelving, drawers, a clock radio alarm and chairs. 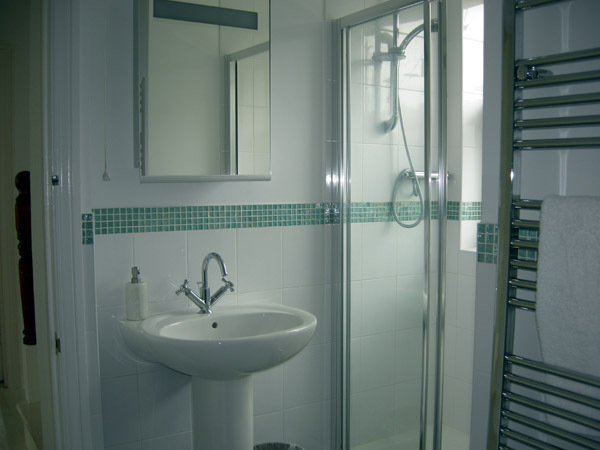 The en-suite shower room has a toilet, wash basin cabinet and power shower. 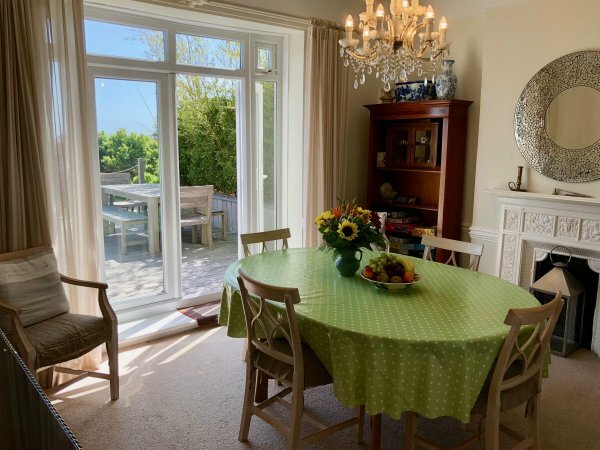 There a large decked area accessed from the living and dining rooms which has a large outside dining table with benches and chairs, a garden bench and two sun loungers. Steps lead down from the decking to the fully enclosed garden.